Pressing the Play button on the back brings up the image last captured. There is very little overlay information. Only the image size (1600x1200), quality (Normal), file number, memory source, battery level indicator, and time and date of capture are shown. Pressing the 4-way controller left or right scrolls through the stored images. Pressing the DISP button enables the display of all of the exposure data: Shutter speed, aperture, ISO value, Best Shot, Flash mode, White Balance and Metering option as well as the histogram. You can quickly search through stored images using the Index playback function which is actuated by pressing the wide angle zoom button. Nine thumbnail size images will be displayed and you can select one using the LEFT/RIGHT and UP/DOWN buttons and then pressing the Set or Telephoto zoom buttons. Pressing the MENU button in PLAY mode brings up this screen. From here you can start an automated Slideshow, display the calendar, copy Favorite pictures to the FAVORITES folder in internal memory, set DPOF printing information, Protect image(s) from deletion, Rotate portrait mode images, Resize image to 1280x960 or 640x480 for web use or email, Trim (crop) images, include a voice memo (Dubbing), create an album to display images, turn the Alarm on or off and Copy images from the internal 9.3MB memory to an SD card or vice-versa. The playback image can be magnified up to 4x in four steps when you press the Zoom Telephoto button. You can scroll around inside of the enlarged image using the 4-way controller. Pressing the Zoom Wide angle button will shrink it back down again. Here you can see the playback of a movie, which is saved in .AVI format. It gives you "VCR" like buttons to control Rewind, Play, Fast-Foward, and Stop. Audio memos up to 30 secs. can be recorded and attached to still images. You can also play back your audio-only clips. The sound will be heard through the camera's built in speaker. If you shot your picture at the highest resolution and need it for email or web use then select the Resize option and create a 1280 x 960 or 640 x 480 size image. The Trimming feature allows you to crop photos in the camera. Create HTML-based photo albums. You can select from a variety of page styles and background colors and then the camera will create all the necessary HTML code. You can now view all your pictures using an Internet browser like Internet Explorer, no special graphic programs required. 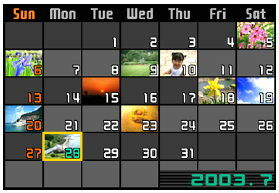 You can display a monthly calendar that shows mini-thumbnails of the first picture taken each day. The clock/calendar function is handy when travelling in other time zones using the World Time function.